Chipotle Chicken Chili is where it’s at for all your football watching, lazy Sunday needs! Make it in the slow-cooker or the Instant Pot and you’ve got the perfect hands-off meal. I love a good chili in the fall. 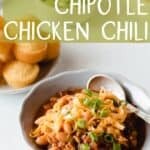 This Chipotle Chicken Chili is no exception! 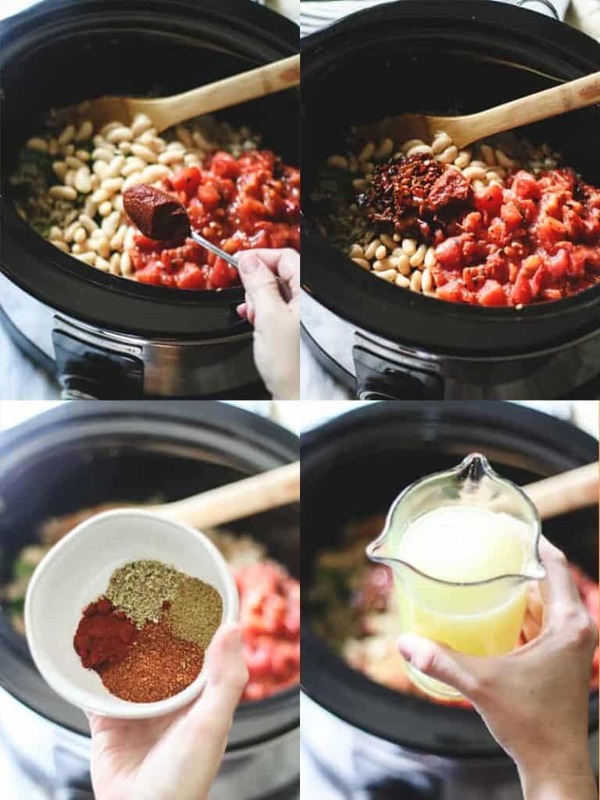 I also love throwing all the ingredients into the Instant Pot or Slow-cooker and walking away for the rest of the day! Who wants to constantly tend to chili on the stovetop, stirring and adjusting the burner? Not me! And as you know, chili is one of the easiest meals you can make but the flavor payoff? Can’t be beat! 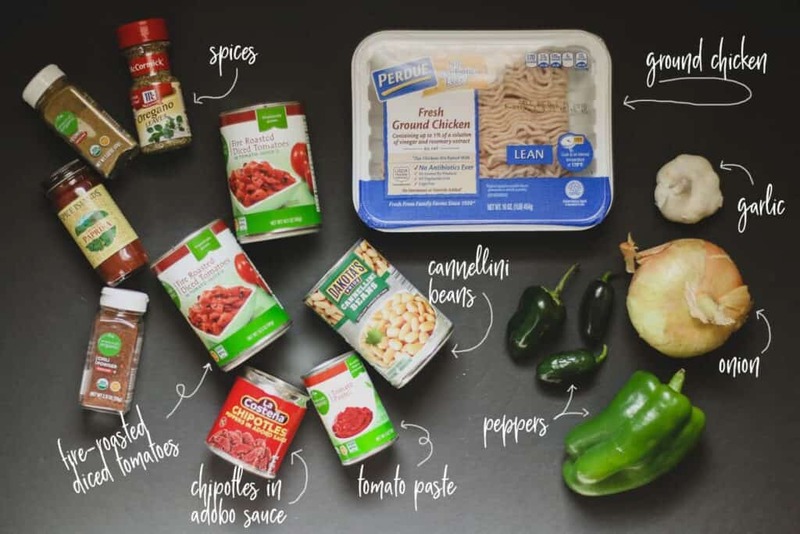 Chipotle Chicken Chili uses super easy, basic ingredients! We’re going to use a lot of pantry staples and a few fresh items from the store. 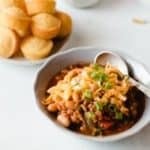 As with any chili, you can change up a few ingredients along the way and still get great results! Ground Chicken: Sometimes you don’t need ground beef. You just don’t! Ground chicken is the star of this party. You can also use ground turkey. Chipotle Peppers in Adobo: You know that can of chipotles you opened when you made these tostadas? Time to put the rest to good use! These little chipotle peppers are going to add a nice smoky flavor to our chili, so please don’t leave them out! Fire Roasted Tomatoes: Speaking of flavor, go with fire-roasted tomatoes! Because why not?! More is more when it comes to flavor! Cannellini Beans: I went with Cannellini beans, but you can use black or red kidney beans too! Peppers: A bell pepper, a jalapeño, and a poblano. The poblano is optional, I had one from my garden so I used it. No biggie if you don’t have one. Spices: Chili powder, Smoked Paprika, Cumin, and Oregano. You should always have these on hand, I use them all the time in my cooking! As with all good chili, you really can’t find a much simpler recipe! It’s basically dump and go, which is my kind of meal! First things first, brown and crumble the chicken and sauté it for a few minutes with the garlic and onion. Since I was using the slow-cooker, I did this step in a pan on the stovetop. If you’re using the Instant Pot you can do this right in the pot with the sauté function! From there on out, it’s easy-peasy! Dump in the peppers, beans, and tomatoes. Then in goes the tomato paste, chipotle peppers in adobo, spices, and chicken broth. Lastly, stir it up & set the timer. Using the Slow-cooker? Cook on low for 6-8 hrs or on high for 4 hrs. 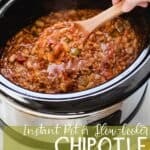 Using the Instant Pot? Cook on High Pressure for 30 minutes using either the bean/chili or manual function. Let the pressure release naturally (NPR). Then remove the lid, put it on sauté, and let it simmer for about 20 minutes to thicken up. 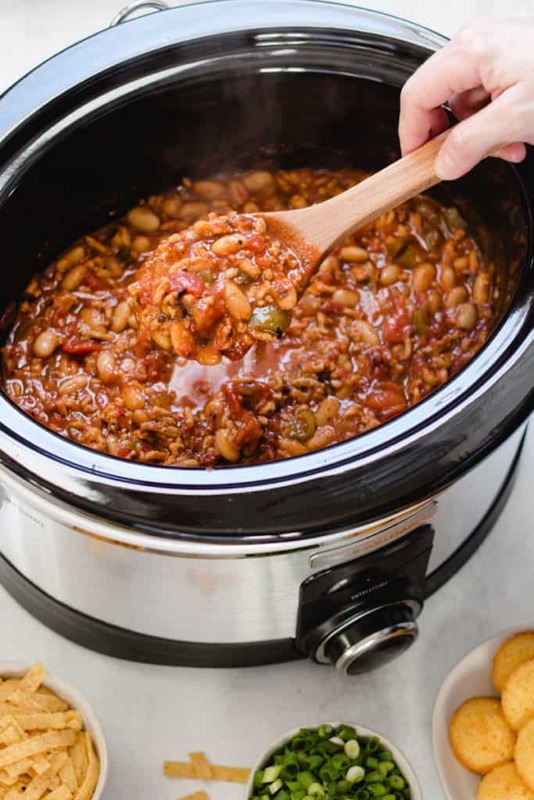 Here’s my two cents on using the Instant pot for chili: Since such a small amount of liquid evaporates when pressure cooking, the chili will still be watery and not very thick unless you do the last step of simmering for about 20 minutes. For this reason, I’m Team Slow Cooker for this recipe. Unless of coarse I’ve procrastinated all day, which is a distinct possibility. In which case, I switch teams and join Team Instant Pot. Either way, I’m winning with this recipe. And that’s it! I mean come on, so easy! Now you’ve got the whole day to curl up with a book, take a nap, or watch the football game. All that’s left to do is bust out your favorite chili toppings and sides! Shredded cheese, sliced green onion, tortilla strips, and cornbread are what I like. What are your favorite chili toppings? If you like this recipe, will you leave a star-rating below? I’d be forever grateful! 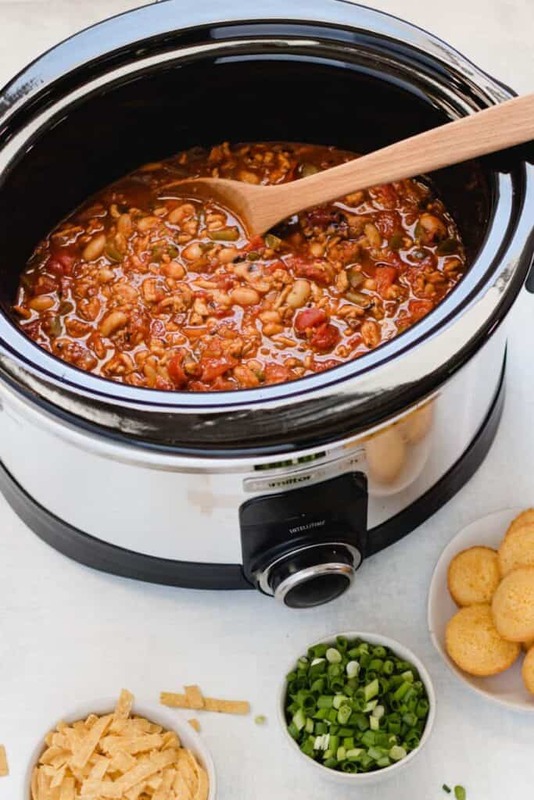 Smoky chipotles add tons of flavor to this easy slow-cooker or Instant Pot chicken chili. Dice the onion and mince the garlic. Remove the seeds from the peppers and dice them. Drain the beans. Remove the seeds from the chipotle peppers (or leave in for a spicier chili.) Set aside. Heat 2 tbsp oil in a large pan over medium high heat. When the oil is hot, add the chicken to the pan. Brown on all sides and break up into small pieces with a wooden spoon. When the chicken in brown, add in the onion and garlic. Sauté for 3-4 minutes until the onions begin to soften. Put the chicken and onion/garlic mixture into the slow-cooker. Add the peppers, beans, tomatoes, tomato paste, chipotle peppers and sauce, chicken broth and spices into the slow cooker. Stir to combine. Cook on Low 6-8 hours or on High for 4 hours. Serve with desired toppings. Put the liner in the Instant Pot and press the sauté function. When the display reads 'hot', pour in 2 tbsp of olive oil. Add the chicken and allow it to cook until browned. Use a wooden spoon to break up the chicken into small pieces. When the chicken in brown, add in the onion and garlic. Sauté for 3-4 minutes until the onions begin to soften. Add the peppers, beans, tomatoes, tomato paste, chipotle peppers and sauce, chicken broth and spices into the pot. Stir to combine. Put the lid on the Instant Pot, turn the valve to sealing. Press the bean/chili or manual button, press adjust if needed to set to High Pressure. Press the +/- buttons to set the time to 30 minutes. After the time is up, allow the pressure to release naturally (NPR). Turn the valve to venting and remove the lid. Hit Cancel. Then press Sauté. All the chili to cook on the sauté mode for 20 minutes to thicken. Serve with desired toppings. 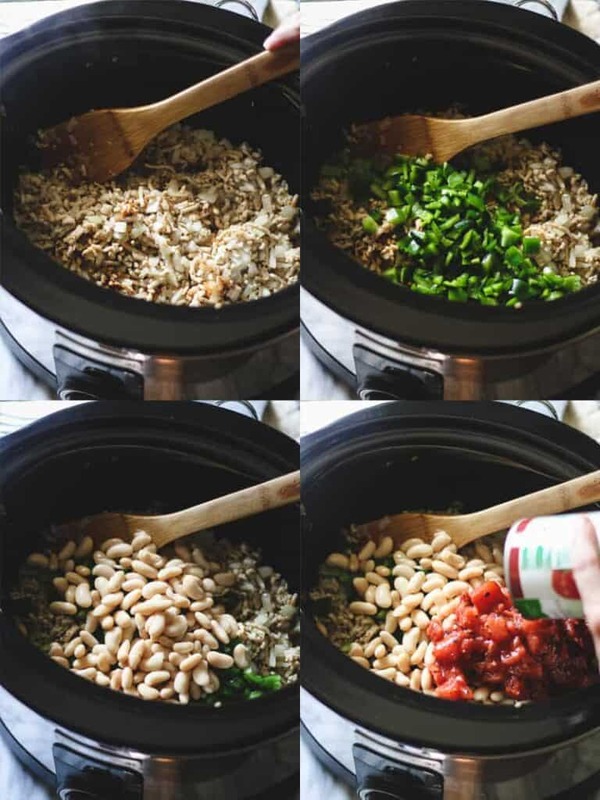 Here’s a link to the slow cooker that I use. 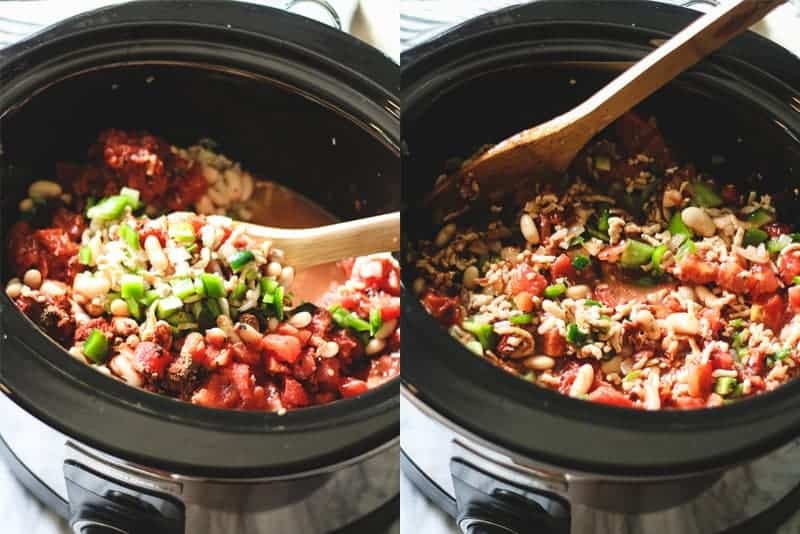 Here’s a link to the Instant Pot. Looks like a great change from my usual boring chili!